Save the date for the 2019 edition of the Nordic Edge - the largest Smart City event in the Nordics! Nordic Edge is taking place in Stavanger, Norway, which is one of the three Lighthouse Cities of our sister project Triangulum. SmartEnCity representatives will be there to talk to you about the successfull implementations in our three Lighthouse Cities as well as the replication status of our two Follower Cities. Come back later for more information! Find more info at the official website. SmartEnCity Network is inviting members and other interested cities to a day packed with workshops on Wednesday, 5th of June in Cagliari, Italy. Integrated Energy Planning methods, experiences of our Lighthouse Cities and the transfer of SmartEnCity knowledge are the core topics of the Workshop Day, so that cities can directly benefit from the project’s outcomes and start their own journey towards a low carbon future. During the last week of March 2019, SmartEnCity project has been represented in several forums in Vitoria Gasteiz Lighthouse City. 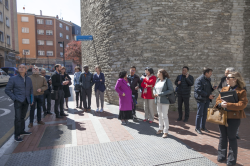 Hosting the 2nd International Network of Michelin Cities Conference and a round table of European Project ANNEX 75, Vitoria-Gasteiz underlined its role as being a front runner in the field of smart and innovative city solutions.